There’s only so much floating you can do in a pool (after your morning laps are completed, of course). Which is why silly, difficult-to-play-while trying-to-stay-afloat pool games exist. Volleyball and basketball come standard, but a Giant Ring Toss is something different. 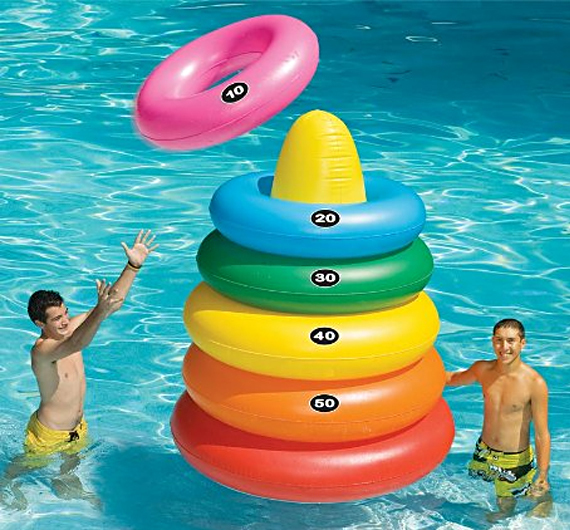 Ideal for the pool, the beach or even just the backyard, the five foot tall game includes a stand and five individual floatation rings. It’s crafted from PVC, easily inflatable, and each ring doubles as a float when a game isn’t in session.